You’ve got a whole house that needs some humidification. You could put a humidifier in every room and let them run, but there’s a better option: a furnace humidifier. These get wired straight into your home’s HVAC system, tap into your home’s plumbing, and create a more comfortable environment without you needing to refill tanks every day. One note before proceeding: furnace humidifiers can be difficult to install, so consulting with an HVAC contractor in your area about this product before purchasing it may be a good idea. Permits may also be necessary according to your local building codes. Furnace humidifiers are only manufactured by a handful of brands, so size, quality, and reliability tend to be the measuring sticks used to determine which one is right for a specific home. The chart below offers you the chance to compare and contrast proven models. Why Choose to Install a Furnace Humidifier? 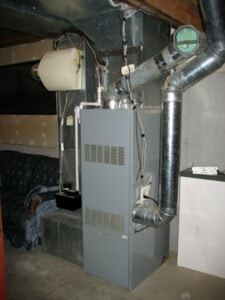 Furnace humidifiers are typically installed within the ductwork of a home right next to the furnace. They add humidity to the home by using the blowing air that heats or cools down your home already. Many of them come with a humidistat equipped so you can adjust humidity levels as easily as you adjust the temperature of your home. Furnace humidifiers often have a ceramic-coated pad, which is called the “evaporator pad,” that saturates with water from your internal plumbing. As the air from the furnace blows through your ductwork and out your vents, it adds humidity to your home as the air circulates. Most humidifiers of this type will use just 1-2 gallons of water per day, which is similar to the best room humidifiers that you’ll find for sale today. If you’re confident in your DIY skills and have obtained whatever permit may be necessary, then you may wish to self-install your brand new furnace humidifier. The video below can help to take you through some of the needed steps. The primary benefit of a furnace humidifier is that you have year-round humidification that is effortless. Just change the humidistat to your desired humidity percentage and the equipment does the rest of the work. There’s no maintenance beyond your yearly HVAC inspections. You’ll also notice a reduction in static shocks that may occur within your home. Your skin may not feel as dry as it usually does. Your hardwood floors will have a reduced risk of shrinking, separating, or cracking. Proper humidity levels of 35-50% also reduce your heating and cooling bills because moisture-rich air will still keep you comfortable even with a few degrees of adjustment. What Are the Prices of Furnace Humidifiers? Furnace humidifiers are an HVAC product, so their costs are higher than most other humidifiers that you’ll find on the market today. Brands like Aprilaire or Honeywell offer entry-level pricing around the $200 mark. If you just need a bypass instead of a full humidification option, you can reduce the price of your equipment by 25%. Some homeowners may need a professional installation, however, and this will add to the overall cost. Furnace humidifiers top out around the $600 mark for today’s largest homes. This is a powered flow-through humidifier that works with your current HVAC system. The installation is relatively easy compared to other models and gives you variable speed options that can be beneficial for some homes. You can mount it on the return air duct or the warm air supply. The design helps to keep the unit fairly clean, even with consistent use, so you won’t have to worry about ongoing maintenance. You will need to have an installation kit in order to install this model, however, so keep that in mind before making a purchase. This is a whole house humidification solution that comes with an automatic digital humidistat. The humidifier is fan-powered, so you get the comfort levels you need with a dependable quality you can rely on without an overt amount of noise pollution. We like the fact that the design allows for any un-evaporated water to simply drain away so you don’t have the same levels of mineral build-up in your system as you do with other models. This humidifier also includes a remote sensor bulb. This model provides you with whole home humidification through the use of an evaporator pad. When properly connected, it will operate every time your furnace turns on, helping you to maintain appropriate humidity levels. Double-check the installation templates before proceeding with a DIY installation to make sure you have everything lined up properly. The connections can be somewhat awkward for some HVAC systems. You may need to have a licensed professional install this unit to have the warranty remain in effect. This is a 120v steam-powered whole house humidifier. It actually works better in larger homes. The manufacturer recommends a minimum size of 1,400 square feet. A flushing timer is included with the design, as well as a filter. The humidistat is pretty basic, with a simple knob to turn to adjust levels, but that works just fine. The rated output is 13 gallons per day, which works with almost any dry environment. This bypass flow-through humidifier will enhance the comfort of your indoor environment for virtually any home. Like other models from this brand, you will need an installation kit to have it properly installed. You can mount it to your warm air supply or your return air duct for added convenience. You will need access to a return duct and a drain, but in return, you’ll be able to improve even the driest indoor environments with ease. The best furnace humidifier can quickly and effectively make your home more comfortable. It may be an investment compared to portable humidifiers, but the results are long-lasting and could even add value to your home. That’s why this option is always worth consideration.